Allosteric sites on muscarinic receptors may present superior therapeutic targets for several central nervous system disorders, due to the potential of allosteric ligands to provide more selective modulation and to preserve the spatiotemporal patterning that is characteristic of synaptic transmission. We have found that the antiarrhythmic drug amiodarone interacts allosterically with M1 and M5 muscarinic receptors. At both M1 and M5, amiodarone was only able to partially inhibit the binding of the orthosteric antagonist [3H]N-methylscopolamine (NMS). In addition, amiodarone was able to alter the rate of dissociation of [3H]NMS from M1 and M5 receptors. These findings suggest that NMS and amiodarone are able to bind to the receptor simultaneously. The pharmacology of the effect on NMS dissociation demonstrated that amiodarone was not interacting at the “common” site at which gallamine, obidoxime, and many other muscarinic allosteric ligands are known to bind. In functional studies, amiodarone enhanced the ability of acetylcholine (at EC20) to activate the M5 receptor; however, under the same conditions, amiodarone did not enhance M1 activation. More detailed studies at M5 found that the effect of amiodarone was to enhance the efficacy of acetylcholine, without increasing its potency. This report describes the first demonstration of allosteric enhancement of efficacy at the M5 receptor, and the first demonstration of enhancement of efficacy but not potency at any muscarinic receptor. In summary, amiodarone has been shown to be a novel positive allosteric modulator of muscarinic receptors that is selective for the M5 subtype, relative to M1. Muscarinic receptors are expressed throughout the central nervous system and have been implicated in numerous neurological disorders, including Alzheimer's disease, Parkinson's disease, schizophrenia, and addiction (Ellis, 2002; Wess et al., 2007; Langmead et al., 2008). Five subtypes of muscarinic receptors (M1–M5) exist, all of which are G protein-coupled receptors and share acetylcholine (ACh) as their endogenous neurotransmitter. To a first approximation, the muscarinic receptors can be separated into two classes. The M2 and M4 receptors inhibit adenylate cyclase by activating Gi. The M1, M3, and M5 receptors stimulate lipid metabolism via Gq-mediated activation of phospholipase C, which then leads to mobilization of intracellular calcium. Ultimately, these intracellular muscarinic signaling responses are much more detailed and complex, and they include activation of protein kinases (including mitogen-activated protein kinases), activation of phospholipases A2 and D (releasing arachidonic acid and choline, respectively), and modulation of potassium and calcium channels (Lanzafame et al., 2003). The advent of molecular cloning and expression has provided the ability to characterize specific muscarinic subtypes with regard to their involvement in various signaling pathways. However, it has proven more difficult to connect each of these subtypes with their physiological role due to a lack of small-molecule ligands that are highly subtype-selective. The most precise documentation of the physiological involvement of specific subtypes has been obtained through the evaluation of knockout mice. For example, in such studies, the lack of the M1 receptor has been connected to specific deficits in working memory and consolidation (Anagnostaras et al., 2003), whereas M5 has been found to be important in other cognitive tasks, perhaps due to its role in regulating the dilation of cerebral blood vessels (Yamada et al., 2001; Araya et al., 2006). At the molecular level, the muscarinic receptors exhibit an unusually high degree of sequence homology at the orthosteric acetylcholine binding site, a property that has hindered the development of subtype-selective ligands (Jones et al., 1992). Many agonists and antagonists bind to the muscarinic orthosteric site with excellent affinity, but none of these is highly subtype-selective. This lack of subtype selectivity means that compounds with high affinity for the muscarinic family have side effects, caused by interactions with multiple subtypes in the family, which has limited their usefulness as therapeutics. For these receptors to be successfully targeted clinically, ligands with much better subtype selectivity are necessary. The failure to develop ligands that target the orthosteric site of individual subtypes has led many investigators to pursue allosteric sites. An allosteric site is defined as a binding site, physically distinct from the orthosteric agonist binding site, that may influence the binding properties of the orthosteric site (Christopoulos and Kenakin, 2002). All subtypes of muscarinic receptors are known to possess allosteric sites (Ellis et al., 1991), and allosteric modulators present several possible advantages over orthosteric agonists and antagonists. The allosteric modulators may have greater binding selectivity, if they are able to bind to less conserved regions of the receptor. Even if they lack binding selectivity, they may be selective on the basis of the degree of cooperativity they possess. That is, an allosteric ligand may be positively cooperative with the endogenous ligand at one receptor subtype but be neutral at all of the other subtypes. Birdsall et al. (1997) have called this type of action “absolute selectivity.” Finally, and especially important in the central nervous system, positive allosteric modulators that exert no receptor response by themselves will only amplify the response of a particular receptor subtype when the endogenous transmitter is present, thus preserving the physiological spatiotemporal patterning of synaptic transmission (Ellis, 1997; Conn et al., 2009). The commonly used antiarrhythmic drug amiodarone has been reported to interact with numerous physiological targets. Studies have shown that amiodarone interacts with several ion channels, inhibiting sodium, calcium, and potassium currents (Kodama et al., 1997) and that it alters adrenergic receptor signaling (Yin et al., 1994; Schnabel et al., 1999). Amiodarone also has been found to inhibit the binding of antagonists to muscarinic receptors (Cohen-Armon et al., 1984; Colvin et al., 1989). In the present study, we have evaluated the actions of amiodarone at M1 and M5 muscarinic receptors in functional assays and in binding studies that were specifically designed to distinguish allosteric or competitive interactions. We have found that amiodarone does bind to an allosteric site on M1 and M5 receptors but that this allosteric site differs from the site that binds gallamine, brucine, and many other muscarinic allosteric ligands. In functional assays, amiodarone enhances the response to ACh at M5 receptors but not at M1 receptors. [3H]NMS (70 Ci/mmol) was purchased from PerkinElmer Life and Analytical Sciences (Waltham, MA), and [3H]arachidonic acid (100 Ci/mmol) was from American Radiolabeled Chemicals (St. Louis, MO). All other reagents were purchased from Sigma-Aldrich (St. Louis, MO). CHO cells stably transfected with human M1 and M5 receptors were used for all binding and response assays. Cells were grown in F-12 media supplemented with 5% fetal bovine serum, 100 units/ml penicillin, and 100 μg/ml streptomycin. Cells were maintained at 37°C in 5% CO2 and 100% humidity. Membranes were collected by harvesting stably expressing cells in ice-cold 5 mM phosphate buffer [(PB) 1 mM KH2PO4 and 4 mM Na2HPO4, pH 7.4]. Cells were homogenized on ice, with three 15-s pulses of a Bio Homogenizer (Biospec Products, Inc., Bartlesville, OK) and centrifuged at 50,000g for 30 min. The supernatant was discarded, and the pellet was resuspended in ice-cold 5 mM PB and stored, in aliquots, at −70°C. For binding experiments, amiodarone was dissolved in DMSO, and the DMSO concentration was maintained below 1% for all assays; all other reagents were dissolved in buffer or deionized water. Equilibrium binding studies were performed as described previously (Ellis and Seidenberg, 1999), except as noted. In brief, these studies were performed in PBS with 1 mM CaCl2 and MgCl2, pH 7.4, for 1 h at 25°C. Binding was measured at 1 nM [3H]NMS, and nonspecific binding was determined in the presence of 1 μM atropine. The affinity of NMS in this buffer is 0.204 nM for M1 and 0.372 nM for M5. Dissociation rate binding studies were performed in PBS + 1 mM CaCl2 and MgCl2 or 5 mM PB, as noted, and 1 nM [3H]NMS at 25°C. Membranes were prelabeled with [3H]NMS for 30 min, followed by addition of 3 μM atropine with or without increasing concentrations of the allosteric modulator(s). Assays were allowed to proceed for 20 to 30 min (M1) or 90 to 120 min (M5) and were terminated by filtration. Binding assays were terminated by rapid filtration through GF/B glass fiber filters (Brandel Inc., Gaithersburg, MD; pretreated with 0.1% polyethyleneimine) on a Brandel cell harvester to trap membranes, and the filters were then rinsed twice with ice-cold 40 mM PB, pH 7.4. Bound radioactivity was measured by liquid scintillation counting in an LS6500 counter (Beckman Coulter, Fullerton, CA). Measurement of [3H]AA release was adapted from the protocols of Conklin et al. (1988) and Felder et al. (1990). CHO cells were seeded on 48-well plates (Greiner Bio-One, Frickenhausen, Germany) at a density of 29,000 cells/well in 0.25 ml of Ham's F-12 media. Cells were incubated until they attached (approximately 3 h), and the media were exchanged for media containing 0.025 μCi of [3H]AA. The cells were then grown for 16 to 20 h before the assay was performed. [3H]AA release was measured in Eagle's basal medium + 2 mg/ml fatty acid-free bovine serum albumin (EM-BSA). Where indicated, studies were performed in bicarbonate-buffered EM-BSA. However, most experiments were performed in EM-BSA buffered with 20 mM HEPES. Cells were rinsed twice with EM-BSA, followed by addition of EM-BSA media containing experimental agents (concentrated stock solutions of all experimental agents were prepared in deionized water). Cells were then incubated for 1 h at 37°C. The assay was terminated by aspiration of the media, and the amount of [3H]AA released was determined by liquid scintillation counting in an LS6500 counter (Beckman Coulter). where X represents the log of the concentration of the ligand used; Y is the amount of response or binding; C50 is the concentration of the ligand that produces 50% of the maximal effect; T and B are the top and bottom plateaus of the curve, respectively; and n is related to the Hill slope for the curve. where X and A represent the concentrations of the orthosteric and allosteric ligand used, respectively; Y is the amount of binding; KX and KA refer to the dissociation constants for each ligand; Bmax is the value for saturation binding; and α is the binding cooperativity exhibited between the two ligands. In this formulation, α > 1 is indicative of negative cooperativity. where kobs is the rate constant observed in the presence of a given concentration of the allosteric ligand and k0 is the rate constant in the absence of allosteric ligand, L is the concentration of the allosteric ligand, m defines the maximal effect of the allosteric ligand on the rate of dissociation of NMS, and K represents the equilibrium dissociation constant for the interaction of the allosteric ligand with the NMS-bound form of the receptor. In some cases, data from equilibrium and dissociation assays were fit simultaneously, to evaluate the consistency of the model; when this was done, K (eq. 3) was constrained to be equal to αKA (eq. 2), and the effect on the goodness-of-fit was evaluated by an F test, using the curve-fitting program Prism (GraphPad Software, Inc., San Diego, CA). Amiodarone Allosterically Modulates [3H]NMS Binding Properties. In agreement with previous studies (Cohen-Armon et al., 1984; Colvin et al., 1989), amiodarone was found to inhibit antagonist binding at muscarinic receptors. Figure 1, A and B, shows that the binding of the orthosteric antagonist [3H]NMS was inhibited by micromolar concentrations of amiodarone at both M1 and M5 receptors. These binding studies were performed in a physiological buffer, PBS + 1 mM CaCl2 and MgCl2. Under these conditions, amiodarone was not able to completely inhibit the specific binding of [3H]NMS at either subtype. That is, when analyzed by eq. 1, the bottom plateau was significantly different from zero (M1: F1,17 = 31.96; p < 0.0001 and M5: F1,17 = 58.65; p < 0.0001). Amiodarone inhibited 82% of specific binding at the M1 receptor, with a log IC50 value of −6.11 ± 0.13, and 64% of specific binding at the M5 receptor, with a log IC50 value of −5.47 ± 0.04. This finding suggests that amiodarone and NMS bind to different sites, such that both ligands can bind to the receptor simultaneously at sufficiently high concentrations. By comparison, Fig. 1C shows equilibrium-inhibition curves for atropine and ACh under identical conditions at the M1 receptor. Atropine and ACh completely inhibited the specific binding of [3H]NMS, as would be expected for these competitive ligands, with log IC50 values of −8.28 ± 0.08 and −4.66 ± 0.06, respectively. [3H]NMS binding and dissociation is inhibited by amiodarone. Amiodarone inhibited equilibrium binding and slowed the rate of [3H]NMS dissociation at both M1 and M5 receptors, in a concentration-dependent manner. The effect of amiodarone on equilibrium binding is shown at M1 (A; ●) and M5 (B; ■). Binding inhibition was incomplete at both subtypes. The effect of amiodarone on the dissociation rate is shown at M1 (A; ▴) and M5 (B; ♦). The two sets of data in each panel were simultaneously fit under the constraint that they accommodate the allosteric ternary complex model (see text for statistical analysis and best-fit values of each curve). This constrained fit is represented by solid lines (equilibrium) and dotted lines (dissociation). C, inhibition of [3H]NMS binding, at M1, by the competitive ligands atropine (○) and ACh (□). Each data point is the average of three experiments expressed as mean ± S.E.M. One of the signature features of allosteric interactions is the ability of one ligand to alter the rate of dissociation of another ligand (Ellis et al., 1991; Ellis, 1997). To investigate this possibility, M1 and M5 receptors were prelabeled with [3H]NMS, and the rate of dissociation was monitored in the absence or presence of amiodarone. The dissociation rates (koff) in the absence of amiodarone were found to be 0.0640 min−1 for M1 and 0.0149 min−1 for M5. Amiodarone was able to slow the rate of dissociation of [3H]NMS to a maximal degree of between 20 and 40% at both receptor subtypes, with apparent log affinities of −5.84 ± 0.13 at M1 and −5.50 ± 0.04 at M5 (Fig. 1, A and B). The equilibrium and dissociation studies described above were carried out in the same buffer, so they can be directly compared. According to the predictions of the allosteric ternary complex model, the interaction of the allosteric ligand with the receptor will alter the affinity of the orthosteric ligand. The change in the affinity of the orthosteric ligand caused by the allosteric ligand is the cooperativity factor α. The model predicts the IC50 value of amiodarone in dissociation studies should be the same as the product of KA and α, determined at equilibrium. The results from the equilibrium and dissociation studies were analyzed using simultaneous curve fitting with equilibrium data fit to eq. 2 and dissociation data fit to eq. 3, as described under Materials and Methods. When the IC50 value was allowed to be independent of αKA, the fit of the combined data to the two equations was not significantly better than when they were constrained to be equal. That is, the IC50 was not significantly different from the αKA, for either receptor subtype (M1: F1,36 = 0.3849, p = 0.5389 and M5: F1,43 = 3.405, p = 0.0719). This indicates that the equilibrium and dissociation data are consistent with each other and with the model. The best-fit values for the constrained analysis are log KA = −6.9 and α = 28.8 for M1 and log KA = −6.0 and α = 6.9 for M5. Amiodarone Interacts with a Novel Allosteric Site. When two allosteric modulators exert markedly different maximal effects on the rate of dissociation of the orthosteric ligand, it is possible to test whether they interact at a common site. This technique has been used previously to demonstrate that gallamine and obidoxime seem to compete for a common allosteric site on M2 muscarinic receptors (Ellis and Seidenberg, 1992). Data from the former article has been redrawn in Fig. 2C as an example of competition at the allosteric site. To investigate the location at which amiodarone exerts its effects, these binding studies were performed in 5 mM PB. The affinity of amiodarone is much higher in this low ionic-strength buffer, a phenomenon that has been reported for many muscarinic allosteric ligands (Ellis et al., 1991; Tränkle et al., 1996). Under these conditions, amiodarone slowed the rate of [3H]NMS dissociation by approximately 40% at both receptor subtypes, with apparent log affinities of −7.25 ± 0.09 at M1 and −7.24 ± 0.42 at M5 (Fig. 2, A and B). The dissociation rates (koff) in the absence of amiodarone were found to be 0.0494 min−1 for M1 and 0.0122 min−1 for M5, in good agreement with previous studies in this buffer (Ellis et al., 1991). Gallamine, another well known muscarinic allosteric ligand, was able to slow the dissociation of [3H]NMS to a significantly greater degree at both receptors, reaching a 78% reduction at M5, with an apparent log affinity value of −5.06 ± 0.13, and a 97% reduction at M1, with an apparent log affinity of −5.70 ± 0.03. It can be seen in Fig. 2C that obidoxime partially reverses the effect of gallamine on the rate of dissociation of [3H]NMS (solid squares), and that the concentration dependence of that reversal is in excellent agreement with the predictions of the model of competitive interaction at an allosteric site (dashed line). This suggests that gallamine and obidoxime bind to the same physical site, although it also remains possible that the binding of the two ligands reflects a strong negative cooperativity. Alternatively, when analogous experiments were conducted with gallamine and amiodarone at the M1 and M5 receptors, amiodarone was not able to significantly reverse the effects of gallamine, and the data deviated dramatically from the predictions of the model (indicated by the dashed lines in Fig. 2, A and B). Thus, it is clear that amiodarone and gallamine must be acting at physically distinct allosteric sites. Amiodarone and gallamine do not act at a common allosteric site. Amiodarone and gallamine both slow the dissociation of [3H]NMS from M1 (A) and M5 (B). Simulation of the data that would be expected of a competitive interaction between amiodarone and gallamine is presented as the dotted line, in each panel, according to eq. 4. At both subtypes, it is clear that amiodarone was not able to reverse the inhibitory effects of gallamine in the manner predicted by the competitive model. Each point is the average of three experiments expressed as mean ± S.E.M. C was drawn from data in Ellis and Seidenberg (1992) and indicates that gallamine and obidoxime are competitive at a common site. The best-fit values according to eq. 3 (see Materials and Methods) are as follows: A (M1): amiodarone, m = 0.443, pK = 7.25; gallamine, m = 0.970, pK = 5.70; B (M5): amiodarone, m = 0.388, pK = 7.24; gallamine, m = 0.775, pK = 5.06; and C (M2): obidoxime, m = 0.566, pK = 4.38; gallamine, m = 0.902, pK = 6.54. Amiodarone Enhances Agonist-Induced Response at M5 but Not M1 Receptors. Initial experiments indicated that acetylcholine stimulated the release of [3H]AA from CHO cells that stably express M1 or M5 receptors. These experiments were conducted in a bicarbonate-buffered system, as described under Materials and Methods, and established that EC20 values for acetylcholine were approximately 30 nM for M1 and 3 nM for M5. In the presence of 3 nM acetylcholine, the addition of amiodarone resulted in a concentration-dependent increase in M5-mediated response (Fig. 3A); the response elicited by 3 nM acetylcholine in the presence of the highest concentration of amiodarone was approximately equal to the response produced by 1 mM acetylcholine alone. However, over the same concentration range of amiodarone, there was no significant enhancement of the acetylcholine-induced response from M1-expressing CHO cells (Fig. 3B). Amiodarone also had no effect on basal response in the concentration range examined (data not shown). Subtype-selective enhancement of ACh stimulated [3H]AA release by amiodarone. CHO-M5 cells (A) and CHO-M1 cells (B) were exposed to ACh at EC20 concentrations (3 and 30 nM, respectively) with increasing concentrations of amiodarone. Data are expressed as a percentage of the response generated by saturating concentrations of ACh (1 mM). This is a representative experiment, carried out in bicarbonate-buffered medium. In subsequent studies, the ability of amiodarone to modulate the responses of a series of muscarinic agonists at the M1 and M5 receptors was investigated. These experiments were carried out in a HEPES-buffered system, as described under Materials and Methods. To choose appropriate agonist concentrations to test with amiodarone, response curves were generated for each of the four agonists (acetylcholine, oxotremorine-M, oxotremorine, and pilocarpine); the results of these experiments are summarized in Table 1. It is notable that the potency of acetylcholine is slightly higher toward the M5 receptor in the bicarbonate system and much higher (approximately 25-fold) toward M1 [judging by the responses to acetylcholine alone in bicarbonate (Fig. 3), relative to the parameters obtained in HEPES (Table 1)]. As has been observed by other investigators (Bymaster et al., 1999), oxotremorine and pilocarpine were partial agonists, compared with acetylcholine. Oxotremorine-M exhibited a slightly higher Emax value than acetylcholine. All of the agonists displayed significantly higher potency at the M5 receptor than at the M1 receptor. The data in Table 1 were used to select the concentration of each agonist that would yield a response in the range of 20 to 40% of the maximal effect, and the ability of 30 μM amiodarone to modify those responses was tested. The results were consistent with those described above for acetylcholine. At the M5 receptor, the response of each agonist was significantly enhanced by amiodarone, whereas the responses at the M1 receptor were not significantly affected (Fig. 4). Experiments were performed in quadruplicate, and maximal response is expressed as a percentage of [3H]AA release stimulated by 1 mM ACh. Data are the average of two or three experiments (mean ± S.E.M.). Effect of amiodarone on the stimulation of [3H]AA release by multiple agonists. CHO-M5 cells (A) and CHO-M1 cells (B) were incubated with the agonist concentrations indicated, with or without 30 μM amiodarone. Amiodarone enhanced the responses of all of the agonists at M5 but did not significantly affect the M1-mediated responses. Curves show data normalized to maximal [3H]AA release generated by 1 mM ACh. Each bar is the average of three experiments expressed as mean ± S.E.M. *, p < 0.05. Amiodarone Enhances Efficacy (Not Potency) of Acetylcholine at the M5 Receptor. More detailed studies were carried out with M5-expressing CHO cells to investigate the mechanism by which amiodarone enhances acetylcholine-induced response. As in Fig. 4 and Table 1, these studies were conducted in HEPES-buffered medium (see Materials and Methods). Somewhat surprisingly, the log EC50 value of acetylcholine was inhibited slightly in the presence of amiodarone, from −7.65 ± 0.07 to −7.45 ± 0.09, although this effect did not achieve significance (F1,56 = 1.841; p = 0.1803). Rather, it was the maximal response elicited by acetylcholine that was found to be enhanced by the presence of 30 μM amiodarone (Fig. 5). This effect was highly significant (F1,56 = 108.3; p < 0.0001). 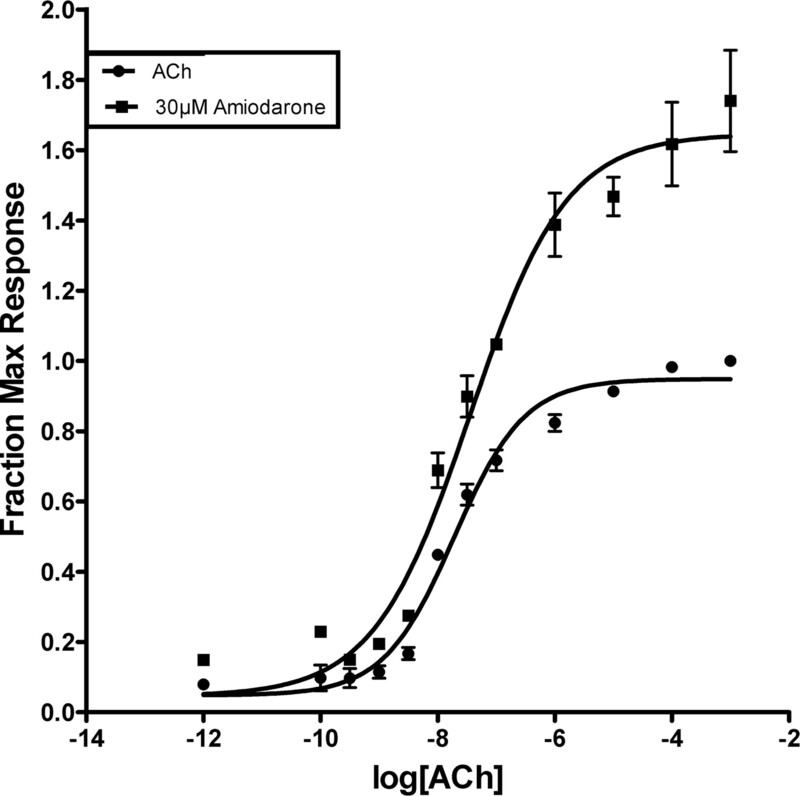 Effect of amiodarone on ACh concentration-response curves at the M5 receptor. Amiodarone enhances the maximal effect elicited by ACh, without enhancing the potency of the agonist. Data were normalized to the degree of [3H]AA release generated by 1 mM ACh. Curves are the best fits to eq. 1; see text for parameter values and statistics. Each point is the average of three experiments expressed as mean ± S.E.M. Two previous studies have found that amiodarone interacts with muscarinic receptors and inhibits radioligand binding (Cohen-Armon et al., 1984; Colvin et al., 1989). Those studies concluded that amiodarone inhibited the binding of orthosteric muscarinic antagonists in a competitive manner in most or all of the preparations investigated. However, those studies differed from our study in that they used different labeled ligands and different receptors in their binding assays; one study used canine heart membranes (i.e., M2), whereas the other study used rat heart (M2) or brain membranes (mixed subtypes). Either of these differences could be responsible for some divergence from our findings, because the choice of orthosteric ligand and receptor subtype are both known to affect the degree of cooperativity observed by an allosteric ligand. Even so, both articles noted some characteristics of their binding assays that deviated from competitive behavior. Cohen-Armon et al. (1984) noted that “The existence of an allosteric site” might explain anomalous binding behavior that was observed with brain stem membranes. Colvin et al. (1989) observed incomplete inhibition of radioligand binding by amiodarone that is similar to the data presented in Fig. 1. Such a partial inhibition of radioligand binding could be indicative of receptor heterogeneity in a tissue that expresses multiple receptor subtypes. However, in a recombinant system that expresses only one receptor subtype, partial inhibition is not consistent with the competitive model; rather, it is definitive evidence that amiodarone does not interact with the orthosteric site, but only at an allosteric site on the receptor (Christopoulos and Kenakin, 2002). Under the conditions used in Fig. 1, it is clear that amiodarone is only able to partially inhibit the equilibrium binding of [3H]NMS at both M1 and M5 receptors. The allosteric nature of the interaction between amiodarone and muscarinic receptors was further confirmed by studies of radioligand binding kinetics. Amiodarone was found to slow the rate of [3H]NMS dissociation from both M1 and M5 receptors to highly significant extents and with potencies that were in good agreement with the parameters of the equilibrium studies. Thus, amiodarone must be interacting with a region distinct from the ACh binding site, because orthosteric ligands do not change each other's rates of dissociation (Ellis, 1997). It is important to examine statements made by Cohen-Armon et al. (1984), suggesting that amiodarone might have decreased the total number of binding sites (Bmax) in binding studies of cardiac membranes (notably, they did not observe effects on Bmax in membranes from forebrain regions, which would contain M1 and possibly M5 receptors). Curiously, these authors then elaborate on this point by further stating that “the inhibitory effect of amiodarone could be eliminated by consecutive washings,” a finding that indicates that amiodarone does not act irreversibly and that thereby contradicts the suggested Bmax effect. In subsequent studies, Colvin et al. (1989) did not report any reduction in Bmax in any of their binding studies with cardiac membranes; furthermore, we have not found any reduction in Bmax in our own study of M2 receptors (Supplemental Fig. S2). Nevertheless, we have carried out additional binding studies with M1, M2, and M5 receptors that have demonstrated that the effects of amiodarone are reversed by simple dilution (Supplemental Fig. S3). Thus, it does not appear that changes in Bmax could have compromised our results. Functional muscarinic receptor response was measured as the stimulation of [3H]AA release from receptor-expressing CHO cells exposed to muscarinic agonists. This assay was found previously to provide robust and reproducible results in multiple cell lines expressing muscarinic receptors, including CHO cells (Conklin et al., 1988; Bymaster et al., 1999). 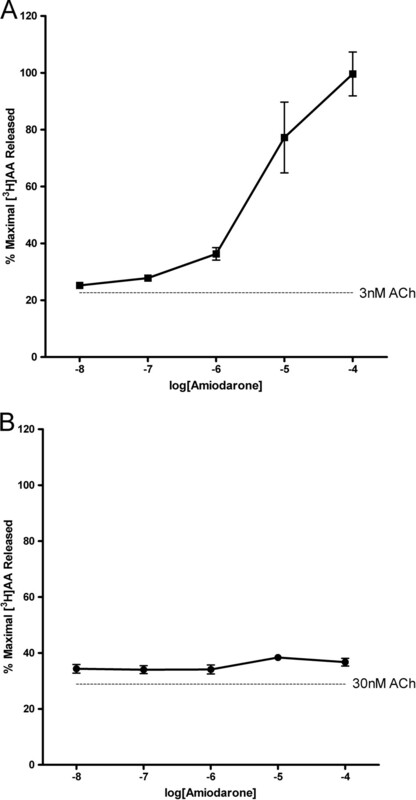 Amiodarone markedly enhanced the response of submaximal concentrations of ACh (EC20) in cells expressing the M5 receptor, at concentrations that were without effect in the absence of ACh; furthermore, amiodarone did not enhance the response of submaximal concentrations of ACh in cells expressing M1 receptors. These data are again consistent with an allosteric site of action and suggest that amiodarone is a selective positive allosteric modulator (PAM) of muscarinic receptors. The action of amiodarone at the M5 receptor was further investigated by evaluating the effect of a moderately high concentration of the allosteric modulator on the ACh concentration-response curve. It is interesting to note that the potency of ACh was not enhanced by amiodarone; rather, the maximal response to ACh was found to be significantly greater in the presence of 30 μM amiodarone. This finding runs counter to the common observation of PAM action at muscarinic receptors, which has typically been expressed as enhancement of the potency of muscarinic agonists. The first reported muscarinic PAM was brucine, which selectively enhanced the affinity of ACh for the M1 subtype (Birdsall et al., 1997). Subsequently, a series of brucine analogs and other unrelated compounds were found to be PAMs at the M1, M2, M3, and/or M4 subtypes (Lazareno et al., 1998, 2000, 2002). More recently, compounds with higher affinities, better selectivities, and greater positive cooperativities have been identified through high-throughput screening assays with M4 and M1 receptors (Shirey et al., 2008; Marlo et al., 2009). In addition, Bridges et al., 2009 reported an M5-selective PAM that acts by enhancing the potency of ACh, without affecting efficacy. Despite the emphasis on the ability of PAMs to enhance agonist affinities, it has long been noted that allosteric ligands should be capable of modulating efficacy as well as potency (Ehlert, 1988), and more recent models have incorporated this potential explicitly (Hall, 2000; Ehlert, 2005). The M4-selective PAM VU100010 has been shown to enhance both the potency and efficacy of ACh in a calcium mobilization assay (Shirey et al., 2008). To our knowledge, amiodarone is the first compound shown to enhance receptor efficacy at the M5 receptor, and the first muscarinic PAM to be shown to enhance efficacy without enhancing potency. Birdsall et al. (1997) introduced the term absolute selectivity, to describe a type of selectivity that would not depend upon the affinity of the allosteric ligand for the receptor but rather upon the degree of cooperativity between the allosteric modulator and ACh. That is, a compound that exerts neutral cooperativity toward all but one of the receptor subtypes would be selective for that subtype irrespective of its binding affinity to the other subtypes. These authors did not restrict the term to the modulation of potency, and it is reasonable to also apply the terminology to modulation based on efficacy. The ability of allosteric ligands to alter the rates of dissociation of orthosteric ligands to different extents has been used by several authors to compare the sites of action of allosteric ligands. If two ligands compete at a common allosteric site, but exert significantly different effects at saturating concentrations, then the effects of one ligand should be able to be reversed by the other ligand, in a strictly concentration-dependent manner. Such experiments have suggested that many of muscarinic allosteric ligands (including gallamine; obidoxime; alcuronium; W84; and strychnine and its related compounds, such as brucine) bind to a common site (Ellis and Seidenberg, 1992; Tränkle and Mohr, 1997; Ellis and Seidenberg, 2000; Tränkle et al., 2005). Complementary mutagenesis experiments have indicated that this common site is located within the extracellular regions of muscarinic receptors, with amino acids in the second and third extracellular loops being most important (Ellis et al., 1993; Voigtländer et al., 2003; Huang et al., 2005). Another site has been defined pharmacologically for compounds related to WIN 62,577 and for compounds related to staurosporine (Lazareno et al., 2002), although the molecular location of this site has not been investigated. In the present study, we have demonstrated that the allosteric effect of amiodarone is not mediated via the well characterized “common” site (that binds gallamine and obidoxime), but the relationship between the binding site of amiodarone and the “WIN” site is not yet known. In summary, we have confirmed previous reports that amiodarone interacts with muscarinic receptors, but we have also demonstrated that it is not competitive with orthosteric ligands. Rather, its ability to modulate the rate of dissociation of the orthosteric antagonist NMS and its inability to completely inhibit the binding of NMS indicate that it interacts at an allosteric site on the receptor. This interaction is novel in several ways. The site is different from the well characterized site at which gallamine and obidoxime interact. Furthermore, the interaction of amiodarone leads to a selective enhancement of agonist-induced response at M5 receptors (relative to M1 receptors). Finally, the enhancement at the M5 receptor is brought about by an enhancement of agonist efficacy, with no increase in potency. We are currently working to better understand the mechanism(s) responsible for these effects by studying additional responses of M1 and M5, as well as the other muscarinic receptor subtypes. We thank Gwendolynne Elmslie for excellent technical assistance. This work was supported by the National Institutes of Health National Institute on Aging [Grant R01-AG05214]. (2003) Selective cognitive dysfunction in acetylcholine M1 muscarinic receptor mutant mice. Nat Neurosci 6:51–58. (2006) Loss of M5 muscarinic acetylcholine receptors leads to cerebrovascular and neuronal abnormalities and cognitive deficits in mice. Neurobiol Dis 24:334–344. (1997) Selective allosteric enhancement of the binding and actions of acetylcholine at muscarinic receptor subtypes. Life Sci 60:1047–1052. (2009) Discovery of the first highly M5-preferring muscarinic acetylcholine receptor ligand, an M5 positive allosteric modulator derived from a series of 5-trifluoromethoxy N-benzyl isatins. J Med Chem 52:3445–3448. (1999) Arachidonic acid release in cell lines transfected with muscarinic receptors: a simple functional assay to determine response of agonists. Cell Signal 11:405–413. (1984) Interaction of the antiarrhythmic drug amiodarone with the muscarinic receptor in rat heart and brain. J Cardiovasc Pharmacol 6:1148–1155. (1989) Interaction of amiodarone and desethylamiodarone with the cardiac muscarinic receptor in vitro. J Mol Cell Cardiol 21:453–460. (1988) Stimulation of arachidonic acid release and inhibition of mitogenesis by cloned genes for muscarinic receptor subtypes stably expressed in A9 L cells. Proc Natl Acad Sci USA 85:8698–8702. (2009) Subtype-selective allosteric modulators of muscarinic receptors for the treatment of CNS disorders. Trends Pharmacol Sci 30:148–155. (1988) Estimation of the affinities of allosteric ligands using radioligand binding and pharmacological null methods. Mol Pharmacol 33:187–194. (2005) Analysis of allosterism in functional assays. J Pharmacol Exp Ther 315:740–754. (1997) Allosteric binding sites on muscarinic receptors. Drug Dev Res 40:193–204. (2002) Muscarinic receptors, in Understanding G Protein-Coupled Receptors and their Role in the CNS (Davies, Pangalos eds), Oxford University Press, London, UK. (1992) Two allosteric modulators interact at a common site on cardiac muscarinic receptors. Mol Pharmacol 42:638–641. (1999) Competitive and allosteric interactions of 6-chloro-5,10-dihydro-5-[(1-methyl-4-piperidinyl)acetyl]-11H-di benzo[b,e][1,4]diazepine-11-one hydrochloride (UH-AH 37) at muscarinic receptors, via distinct epitopes. Biochem Pharmacol 57:181–186. (2000) Interactions of alcuronium, TMB-8, and other allosteric ligands with muscarinic acetylcholine receptors: studies with chimeric receptors. Mol Pharmacol 58:1451–1460. (1991) Allosteric regulation of cloned m1–m5 muscarinic receptor subtypes. Biochem Pharmacol 42:1927–1932. (1993) Use of chimeric muscarinic receptors to investigate epitopes involved in allosteric interactions. Mol Pharmacol 44:583–588. (1990) A transfected m5 muscarinic acetylcholine receptor stimulates phospholipase A2 by inducing both calcium influx and activation of protein kinase C. J Pharmacol Exp Ther 255:1140–1147. (2005) Critical amino acid residues of the common allosteric site on the M2 muscarinic acetylcholine receptor: more similarities than differences between the structurally divergent agents gallamine and bis(ammonio)alkane-type hexamethylene-bis-[dimethyl-(3-phthalimidopropyl)ammonium]dibromide. Mol Pharmacol 68:769–778. (1992) Muscarinic acetylcholine receptors, in Molecular Biology of Receptors Which Couple to G-Proteins (Brann MR ed), Birkhauser, Boston, MA. (1997) Cellular electropharmacology of amiodarone. Cardiovasc Res 35:13–29. (2008) Muscarinic acetylcholine receptors as CNS drug targets. Pharmacol Ther 117:232–243. (1998) Subtype-selective positive cooperative interactions between brucine analogues and acetylcholine at muscarinic receptors: radioligand binding studies. Mol Pharmacol 53:573–589. (2000) Allosteric interactions of staurosporine and other indolocarbazoles with N-[methyl-(3)H]scopolamine and acetylcholine at muscarinic receptor subtypes: identification of a second allosteric site. Mol Pharmacol 58:194–207. (2002) Analogs of WIN 62,577 define a second allosteric site on muscarinic receptors. Mol Pharmacol 62:1492–1505. (2009) Discovery and characterization of novel allosteric potentiators of M1 muscarinic receptors reveals multiple modes of activity. Mol Pharmacol 75:577–588. (1999) Beneficial effects of amiodarone in heart failure: interaction with beta-adrenoceptors rather than G proteins. Eur J Pharmacol 369:391–394. (2008) An allosteric potentiator of M4 mAChR modulates hippocampal synaptic transmission. Nat Chem Biol 4:42–50. (1997) Divergent modes of action among cationic allosteric modulators of muscarinic M2 receptors. Mol Pharmacol 51:674–682. (2005) Atypical muscarinic allosteric modulation: cooperativity between modulators and their atypical binding topology in muscarinic M2 and M2/M5 chimeric receptors. Mol Pharmacol 68:1597–1610. (1996) Search for lead structures to develop new allosteric modulators of muscarinic receptors. J Pharmacol Exp Ther 279:926–933. (2003) Allosteric site on muscarinic acetylcholine receptors: identification of two amino acids in the muscarinic M2 receptor that account entirely for the M2/M5 subtype selectivities of some structurally diverse allosteric ligands in N-methylscopolamine-occupied receptors. Mol Pharmacol 64:21–31. (2001) Cholinergic dilation of cerebral blood vessels is abolished in M(5) muscarinic acetylcholine receptor knockout mice. Proc Natl Acad Sci USA 98:14096–14101. (1994) Antagonism between T3 and amiodarone on the contractility and the density of beta-adrenoceptors of chicken cardiac myocytes. Eur J Pharmacol 261:97–104.